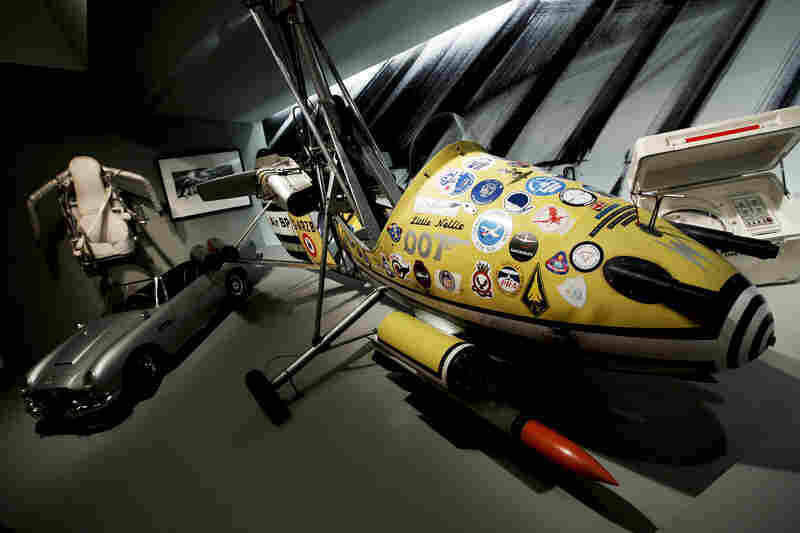 Interview: Neil deGrasse Tyson On James Bond's Gadgets The James Bond film franchise may be turning 50, but its gadgets will never get old. Astrophysicist Neil deGrasse Tyson and NPR's David Greene dig through the inventory of Bond's best contraptions. 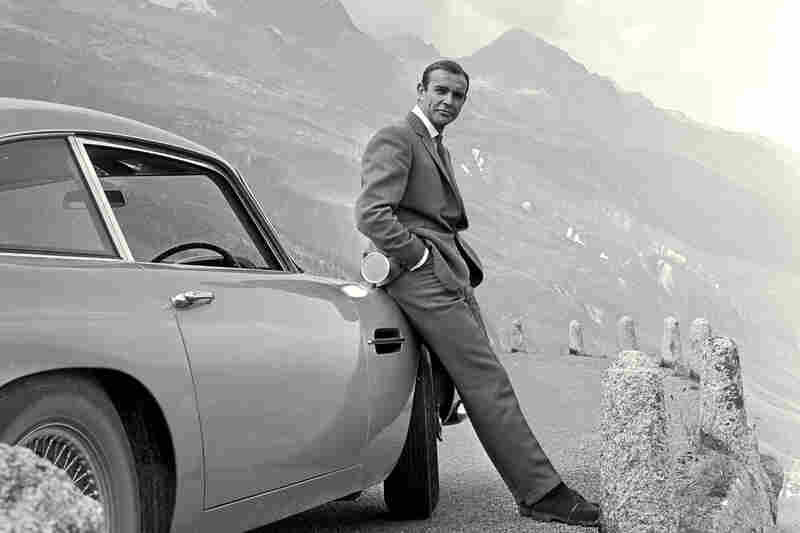 Sean Connery relaxes on the bumper of his Aston Martin DB5 during the filming of location scenes for Goldfinger in the Swiss Alps in 1964. 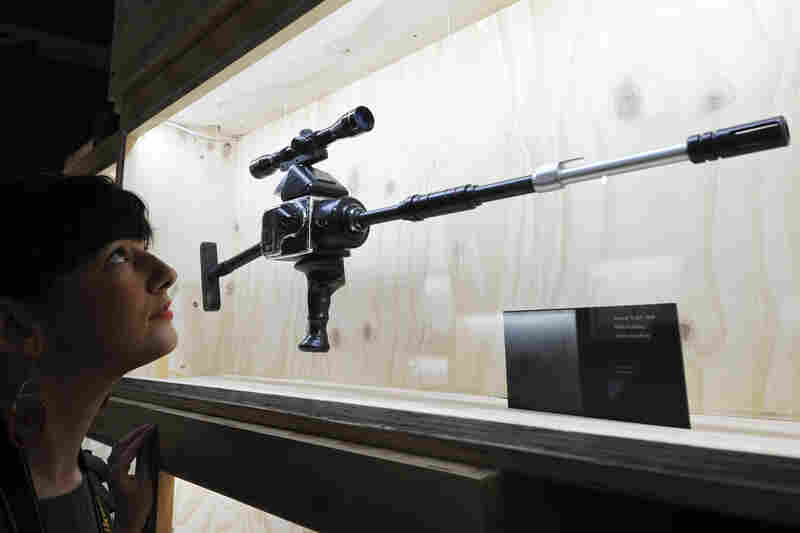 The "Hasselblad Gun" used in Licence to Kill, on display in an exhibition entitled Designing 007: Fifty Years of Bond Style at the Barbican in London. 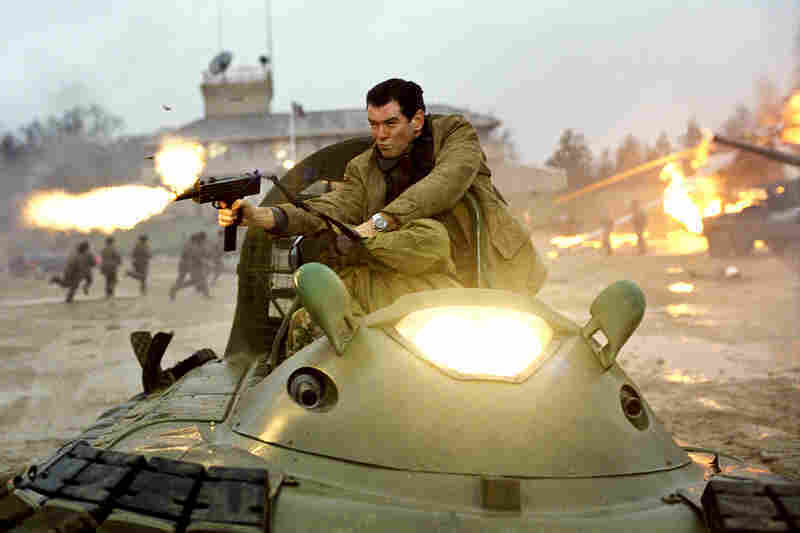 Pierce Brosnan in a high-speed hovercraft chase in Die Another Day — Brosnan's fourth and final Bond film. 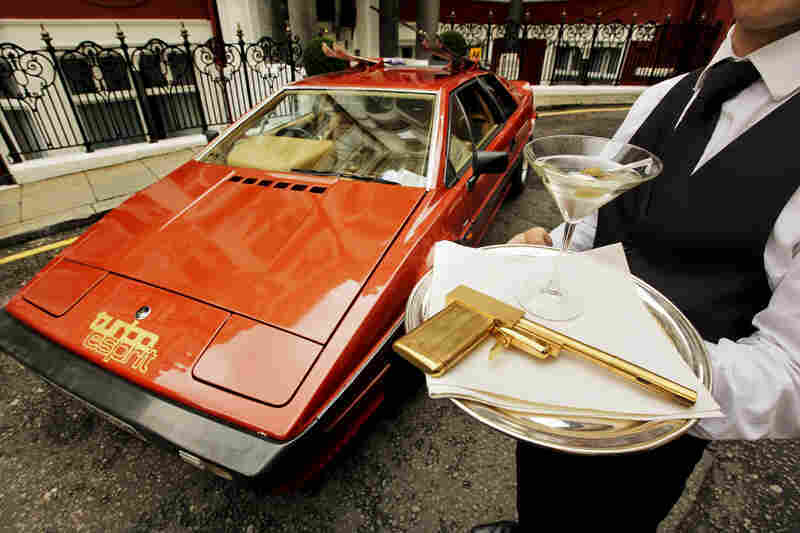 A model holds a limited-edition gold-plated Golden Gun replica, near a Lotus Turbo Esprit car from 1981's For Your Eyes Only. A scene from 1973's Live and Let Die features Jane Seymour and Roger Moore. In the film, Moore wears a supermagnetic wristwatch said to deflect bullets at long range. Various vehicles used by James Bond, on display at the For Your Eyes Only: Ian Fleming & James Bond exhibit at the Imperial War Museum on April 16, 2008, in London. 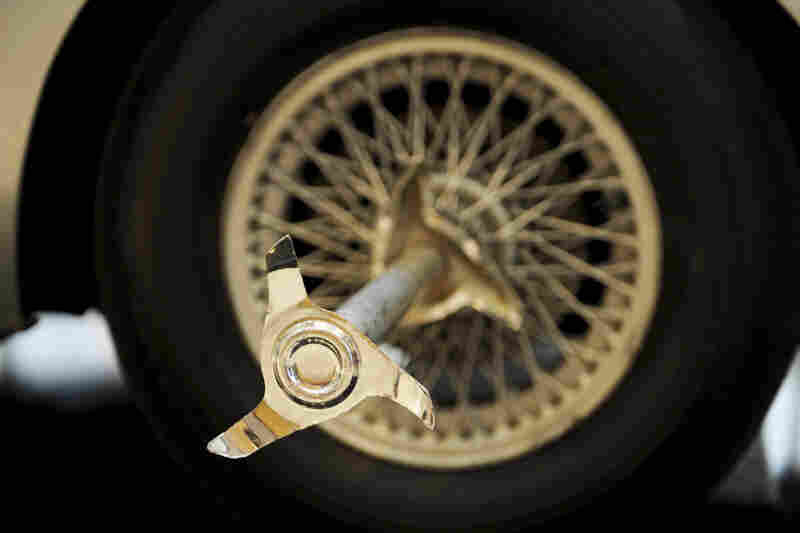 A tire-splitter is attached to the Aston Martin DB5 driven by actor Sean Connery in Goldfinger and Thunderball, part of a 2010 auction at Sotheby's in New York. 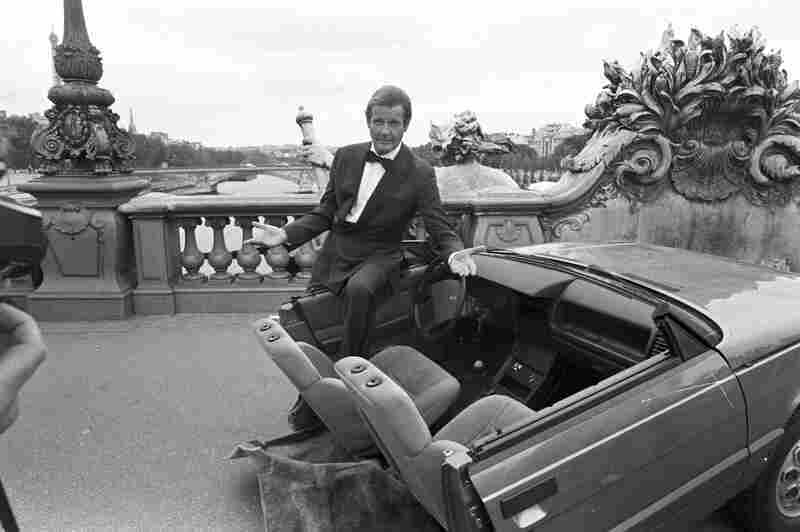 Roger Moore with half a car during the filming of A View to a Kill in Paris, 1984. Moore was part of the iconic series for more than a decade, playing Bond in seven consecutive films. James Bond — the film franchise, that is — is turning 50. But if 007 is getting up there in years, his gadgets will never get old. Throughout the series, the creators have always come up with wild gear for Bond to bring along on his missions — while often taking a lot more creative license than they might have needed. They've come up with pieces that were inventive and prescient at best, impossible in the real world at worst, as astrophysicist Neil deGrasse Tyson tells NPR's David Greene. Tyson and Greene dig through the inventory of Bond's best contraptions, scoping out which tools prove scientifically viable, fact checking the ones that are not, and discussing why his gadgets are still relevant, even today. "I was younger at the time, of course, as was everyone who's watching it — but I knew that bullets are made of lead. Lead is not magnetic. So you're not deflecting bullets with your magnetic device. I'm sorry — all right, if bullets were made of nickel or cobalt or iron, yeah, then maybe it could do something. But no! I'm sorry. ... I didn't give him that one. I said, 'Nope, you messed up there.' "
"Rigid, brittle things can break if you find the resonant frequency. This is the frequency that the material wants to vibrate at — if you do that and then up the volume level, you can shatter it. And that's all real. But the fact that you can carry it on your ring — that's a little harder to take. But it's James Bond, and so he gets stuff that you don't." "I want one of those. Whether or not it's an Aston Martin. I mean — so first of all, there are invisible things in the world, and they're called transparent, OK. Glass is essentially invisible to the light that we see with our eyes. It's not invisible to other forms of light, like ultraviolet or infrared. The cameras on the other side of the car have to look at every possible angle that you would be viewing the car, from your side. And we haven't figured out really how to do that yet." "You know, I hadn't thought about that. I think — hmm. What made the Bond gadgets attractive is that they used a little bit of what you already knew was out there, and just took it to some extreme, forcing you to say, 'Yeah, that could happen,' even if it had to violate a few laws of physics along the way."